Stunning beach front house. Sleeps 6 adults and 4 children. The perfect place to relax and unwind. Situated at the mouth of a river, teaming with bird life. The resident Fish Eagle will make fishing in front of our house an African adventure. Unbroken views of the river mouth and the sea. A short path down to the secluded beach. Shops, farm stalls, curios, restaurants, golf courses, movie theaters all within a 30 minute drive. My name is Debbie Votin. My husband Zsolt and our 3 children Thomas, Hannah and Harrison love travelling, cooking, the outdoors, architecture and beautiful spaces. KZN has the most wonderful weather all year round. We love escaping freezing Johannesburg for a summer holiday in the middle of South African winter. Any time is summer on the South Coast. Our house has everything we need. Lots of books, lots of movies, bikes, kites, swimming pool and most importantly the beach on our doorstep. Open plan kitchen including cooker, hob, extractor, coffee machine, fridge, separate freezer, vegetable steamer, snackwich machine, smoothie maker, water purifier, microwave. Laundry room with washing machine and tumble dryer. The South Coast is know for its Golfing. San Lameer, Southbroom etc 15 minutes drive. The house is all on one level. However, the path down to the beach in not suitable for wheelchair access. Outside: Covered lock up patio (Steel reinforced stacking doors) with full outdoor furniture as per earlier description, Pool is private. Utility Room: Weber BBQ, Portable beach BBQ, 2 Mountain bikes, Umbrellas and lots of beach toys, bats n balls, Trick kite. Cleaning / Towels / Linen / Maid service: 4 towels per bedroom included - 2 beach towels, 2 swimming towels. 16 towels in total (spare in the store room if you need) washing and drying of linen and towels included. Maid service included and compulsory for rentals. Daily cleaning included. Other: Domestic workers room, with kitchenette, cooker, fridge etc and en-suite. large covered patio with corner sofa, 8 seater dinner table, day bed and kids corner with craft cupboard. We absolutely loved our stay at Debbie's beach house in Munster. The open plan living area was so nice for family relaxing and cooking. All but one bedroom is on suite with something for everyone. The views from the front veranda were stunning with ocean views and the beach was almost private most days. There is also a swimming pool for when not on the beach. The cherry on the top was Gertie who minds the house and she made our stay that much more enjoyable. Thank you Debbie and Gertie. We will definitely be back. Beautiful location and really nice accommodation. Absolutely magical family holiday. The most amazing setting with extraodinary views. Perfect settling for a family holiday. Everything you could need and want for kids. So lovely to be in walking distance to the beach and to wake up to that view!!! The house has a spectacular location. The housekeeper is good with children and very reliable. The house is clean with anything you could need and more. Fun activties in the area for rainy days and keeping children occupied. Open spaces and large bedrooms make it easy for 8 people to be in the house without falling over each other. The pool is a "win" with children. There is no better patio in the world....rare birdlife...view...relaxation....this is the house! Our house is on a beach where the river meets the ocean and a beautiful lagoon exists. There is a Blue Flag Beach - Glenmore beach that can be reached from our beach - 20 minute walk BUT i doubt you will want to leave our beach. Durban King Shaka International Airport is 2 hours drive from our house. Car Hire is recommended. Munster Village is very small, has a video shop, supermarket, bottle store and garage. Port Edward is about 12km / 5 mins drive and has a pizza place, hardware store, supermarket, butchery, bottlestore and some other odds and ends. Shelly Beach is 25 mins drive has lots of shops etc. 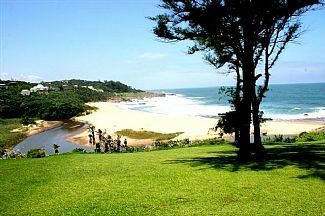 The drive to Shelly beach takes you through lots of small coastal villages with art, curios, nature reserves etc. Banks in Port Edward 5 mins drive. Changeover Day: Change over day is flexible but if new booking arrival cross over is applicable, departure to be by 11 am.